Scarring negatively affects a person’s self image. Advancements in cosmetic procedures surgical and non-surgical provide alternatives in revising hair transplant scars or scars in other areas of the body that have hair. Follicular Unit Extraction (FUE) allows a hair transplant surgeon to individually remove donor grafts without a measure incision in the patient’s scalp. This means a small number of grafts can be used and placed within recipient sits within a scar. This means scars in other places that have hair (eyebrows, pubis etc…) can be treated by transplanting of a small number of follicular units into the scar and on its margins to blend it to the surrounding area. Scalp Micro-pigmentation is used to simulate stubble hair making it also good for obscuring scars. Scalp Micro-Pigmentation (SMP) is a non surgical cosmetic procedure that can be used in scar revision. It can works well with scalp scars. Special pigments are injected into the scar. The appearance is like stubble hair. It is injected into the scalp in a manner to obscure the scar or make it blend into the surrounding area. These more recent advances in cosmetic procedures; FUE and SMP are performed in Los Angeles hair transplant centers like US Hair Restoration. The modernization of hair restoration has made it an option for many men. The scarring from follicular unit transplantation which is a natural permanent solution to hair loss is a concern for many patients. Fortunately a number of techniques have been developed to minimize donor scarring when using a strip excision during this surgery, as well as, post surgical solutions that can be done even years later. These advances in minimizing scarring makes FUT one of the best hair transplant treatments for men. Scar minimization from the donor incision is an important component of a successful hair transplant procedure. 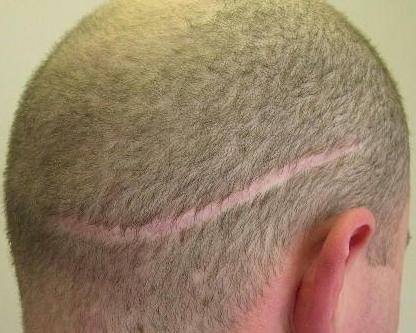 A fine donor scar gives the patient more flexibility in hair styles post surgery. When the scar is fine the close cut military type hairstyles chosen by men and women can still be worn after hair restoration. The ideal placement of the donor incision is in the mid-part of the permanent zone located in the back and sides of the scalp. This area lies in a band that starts above the occipital protuberance (the bump felt in the middle part of the back of the scalp) and extends to either side in a gentle, upward sloping curve that follows the contour of the scalp. If hair is harvested below this region, there is a greater risk of scarring from the wound stretching, since the incision will be too close to the muscles of the neck. If the incision is above this area, the hair may not be permanent and may fall out as the baldness progresses. The length of the donor incision is determined predominantly by the number of follicular unit grafts required for the hair restoration, the width (height) of the donor incision depends upon the patient’s scalp laxity. This is a genetic attribute of the patient’s scalp that must be carefully measured by the hair transplant surgeon during the initial evaluation. With good scalp laxity, a wider strip may be harvested from the donor area without the risk of scarring (although patients with very loose scalps may be at increased risk of a wide scar If the scalp is too tight, taking a normal size strip may be impossible. If the strip width is too narrow, the incision will need to be unnecessarily long to obtain an adequate amount of donor hair. If the strip width is too wide, the risk of having a widened scar will be increased significantly. Expert clinical judgment, acquired over years of experience, is needed for the surgeon to consistently set the appropriate length and width of the donor strip and achieve the minimum possible scar. Scarring is an inevitable part of hair restoration and physicians performing hair transplants are always challenged to reduce scarring as much as they are able. The strip method which is the most popular form of hair restoration surgery requires a donor strip to be taken from the permanent zone which requires the doctor to pay close attention to wound closure and scar reduction. Some patients have suffered trauma that may have left unwanted scar. Hair, can naturally cover scars in most cases. However, when it happens to be close to the hairline or depending on the patients hair style it can be harder to cover up. Since the advent of hair transplant surgery, hair transplant surgeons have been challenged to address the scarring that is inevitable from the donor wound in strip hair transplants. Other types of scalp surgeries such as neurological surgeries can also leave linear type scars in the scalp. In addition trauma to the head can leave a person with unwanted scar. A patient’s natural hair coverage can obscure the visibility of a scar in most cases. However, proximity to a patient’s hairline and or wearing the hair too short can make a scar more obvious. Surgeons can repair or disguise most scars. The differences of shape as well as the placement and size of the scars will determine the technique that is used by the surgeon. The goal is to revise the scar so that it may be almost invisible. This scar revisioning is far more than a cosmetic need. Scars can affect the person’s self-esteem. Surgeons are in the forefront of minimal scarring. Addressing scalp scarring from trauma and scalp surgeries. A hair transplant surgeon can easily repair or camouflage most scalp scars. The variations in a scar shape, location and size are key factors affecting the techniques that a surgeon will use in the revisioning of the scar. The singular and most important purpose of the scar revisioning is to obscure or minimize its appearance to the naked eye. Scar revisioning is not merely cosmetic. Disfigurement from scarring often affects a person’s sense of well being and self worth. Do to the inherent nature of the work they do cosmetic surgeons are at the forefront of minimizing the appearance of scars. We have developed an algorithm utilized in hair restoration and other surgical cosmetic practices that effectively meets the challenge of scarring from these procedures. Many of the same techniques are also employed in addressing scalp scarring from trauma and scalp surgical procedures. A wider scar can come to be as the result of stretching. Stretched skin can have a variation in color, different from the skin surrounding the scar. Bringing hair into the scarred area can meld this difference. Blending the contrast is the key to success. Follicular unit grafts with FUE and trichophytic closure on one or both edges of the scar is the best technique. Many people need various transplants into the scalp to better disguise the scar. A scar that is wider than expected gives evidence that some level of stretching has occurred. Skin that is stretched typically has a contrasting color to neighboring skin. Minimizing this contrast is one of the key approaches to reducing this type of scar. Hair transplant surgeon can reduce the contrast by bringing hair inside the scar by a variety of techniques to minimize the contrast between the hair bearing scalp and non-hair bearing scar. That is done through placing follicular unit grafts with FUE procedure or by performing trichophytic closure on one or both edges of a scalp scar. Many people may need more than one hair transplant into their scalp to improve the reduction in visibility of the scar. If you are suffering from a scalp scar, you need to find a good hair transplant surgeon with plenty of experience with treatment of scalp scars. A simple consultation would make the overall plan clear. The plan may include a surgical procedure, using cosmetics for hair and scalp and hair style changes.